What, really, is Netanyahu’s game plan for America? My headline question was provoked by Netanyahu’s response to the P5+1 agreement with Iran which he called “an historic mistake” and an editorial in The New York Times described as being “clearly in the best interests of the US and the other nations that draftedit and Israel.” (My emphasis added). The NYT’s editorial view was subsequently endorsed in a letter signed by more than 100 former US ambassadors and then a statement signed by 60 former senior officials and lawmakers with extensive national security experience. Then came the UN Security Council’s unanimous adoption of a resolution endorsing the nuclear deal with Iran and paving the way for the lifting of sanctions on the Islamic Republic. On the battle to come the headline over a story in The Times of Israel put it this way. AIPAC girds for rare high-noon showdown with White House. The first question arising is this. Does Netanyahu really believe that with AIPAC’s assistance he can mobilize Zionism’s election campaign funders and those in Congress who do their bidding to kill the deal? Unless he is completely out of touch with the way things are moving in Washington D.C, Netanyahu must know there is no chance of Congress coming up with the two-thirds majority necessary to over-ride an Obama veto of legislation to kill the deal. So what, really, is Netanyahu’s game plan for America? 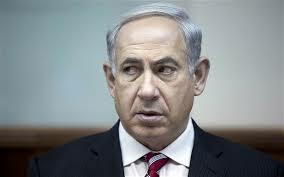 In that light it seems to me Netanyahu’s game plan is to say and do whatever he thinks will assist the Republicans to rubbish President Obama and win the White House in 2016, in the hope that a Republican president will kill the deal. If that is the hope in Netanyahu’s deluded mind it is no doubt being encouraged by the statements of all the Republicans who are offering themselves as presidential candidates. Senator Marco Rubio of Florida has said, for example, that it will be “up to Obama’s successor to overturn the deal”. He added that if he is the next occupant of the Oval Office, he will re-impose sanctions on Iran. Unless they are unaware of the findings of America’s various intelligence agencies and/or have chosen to ignore them, they must be aware that Iran is not developing a nuclear bomb and does not want to possess nuclear weapons. And unless they are completely stupid they also know that even if Iran did possess a few nuclear bombs at some point in the future the idea that it would launch a first strike on Israel is ludicrous in the extreme. To do so would lead to Iran’s annihilation in a retaliatory strike and no Iranian leader would be mad enough to invite such a catastrophe. Why then are all the Republican would-be presidents speaking from Netanyahu’s script and dancing to his tune? The short answer is in two parts. The first is their ignorance. I mean that they have no knowledge of the truth of history as it relates to the making and sustaining of the conflict in and over Palestine that became Israel. They are completely unaware, for example, that Israel’s existence has never, ever, been in danger from any combination of Arab military force. (As I explain and document in detail in my three-volume book Zionism: The Real Enemy of the Jews, the Arab regimes, despite some face-saving and stupid rhetoric to the contrary, never, ever, had any intention of fighting Israel to liberate Palestine. The notion that Israel has lived and still lives in danger of annihilation, the “driving in the sea” of its Jews, is Zionist propaganda nonsense at its brilliant best. Zionism’s success in selling it to the political and mainstream media institutions of the West is the reason why a diplomatic resolution of the conflict has been and remains a mission impossible). The second is their hunger for Zionist campaign funds. On the Republican side the biggest single donor is casino-owning Sheldon Adelson, estimated by Forbes to be worth $29.4 billion. Last year he and his wife Miriam reportedly contributed $100 million to help the Republicans retake the Senate. In recent months it has become clear that any Republican thinking of running for the White House needs Adelson’s blessing as well as his money, and that’s why some say he now effectively “owns” the Republican party. For the sake of discussion let’s assume for a moment that the next American president is a Republican (Jeb Bush or some other). Would he actually do what Netanyahu and Adelson want and kill the deal with Iran? I think the answer is almost certainly “No” and here’s why. He would not be in the Oval Office until January 2017 and that is some way down the road. If between now and then the P5+1 nations and Iran have lived up to their commitments, trade with Iran will be booming. (The scramble to get a slice of the Iranian pie is already underway). Unless he is a complete idiot no American president would want to put an end to that and open the door to a war that would have catastrophic consequences for the region and very probably the whole world. In that light and assuming all parties to the agreement with Iran honour their commitments there is in theory a case for saying that Netanyahu can’t win – that he has dug and is still digging himself into a deep, dark hole from which there is no escape, and in which he will die politically. In the paragraph above I emphasized in theory because even if the agreement with Iran is alive and well in 2017, and even if a Republican president is prepared to live with it, Netanyahu would still have ways to sabotage it. He could order a false flag operation – an attack on American interests somewhere which with manufactured/false evidence he would blame on Iran. That could, probably would, give American neo-cons the pretext they would like for war on Iran. (The so-called Christian fundamentalists in the neo-con camp who support Israel right or wrong are probably praying for just such an outcome. Also worth noting is that in the past Adelson himself has talked about the need to attack Iran with a nuclear bomb). In his body language over the past few days Netanyahu has seemed to me to be uncomfortable and even a little bit desperate. But he is not yet down and out. Perhaps Netanyahu is hoping that the upcoming "shemitah" (world financial collapse in goy-ese) will create enough confusion to let him get that war started. Zionist fanatics hope to see the "red calf" soon sacrificed in the new temple on the site of Dome of the Rock. And many of them see 2016 as the start of the "Messianic age" when their Messiah will exact terrible vengeance on the goyim. Ted Cruz and his father see this as the coming "rapture of the wealth" to Zionists and their Christian subordinates. I wish the Arab states hostile to Iran could appreciate their foolishness in siding with Israel against Iran. Iran is not part of Eretz Israel--they are. Perhaps some of the leaders in Saudi and elsewhere are covertly Zionist Jews as has long been rumored. This 'Treaty' was A Long time In Coming to fruition. And Nothing is Going to Cancel It OUT. That These REPub- War-mongers Even Think of Trying to Cancel IT out..Is Only Showing The World Their Total Ignorance..And their Disregard For This World WE all Must Either Learn to Live in Together..Or else.. we will all perish. These Neo-con-Zionists Must Take Their ""War-peddling Butts ' Out of This Guvmt.. [Or They will Be Run out By their Own People. The Jews of This Country who Are Fed up with Them.] It is Past due time To Cut That Stolen acreage They Call Israel.. OFF..Once And For all time. And Time Our Country Realized Our Resources Should Never Be Sent There...but Kept HERE..Caring FOR OUR own Country..This U.S. of A. Our Citizens Do not Want To Support A Place That Just Exists TO Kill. And to do so Makes Us Citizens Complicit, and So Wrong. The People Of This Country Do not Want To Support 'leaders' Who Persist In This Direction. It is So Plain that Peace can Never Come About as Long as We allow These Kinds of ''Leaders'' TO Stay in Office. They Have TO GO. END this Crazy Dual-Citizenship..Now !! America FIRST, Last And Forever !! Then and Only Then..God Will Bless America ! All the brouhaha about Iran is not about its nuclear programme; it is just a charade in a game of nations. The only difference between Israel and its stooges in the western world is only the timing and method of execution of its designs. Israel is just impatient. Everybody knows that the 'deal' is just ink on paper and when push comes to shove, it will be relegated to the dustbin of history at whim. The only amusing thing in this episode is that the US is allowing its parasite, Mighty Mouse, to flex its muscles! Israel is playing big game just to have more "compensations' from the US: money, weapons, unconditionnal political support...The deal with Iran can't be reasonnably canceled. The powerful groups that control the US foreign policy in the Middle East have jumped into the ‘nuclear arena’ as the UN security Council ratified the so-called P5+1 agreement to stop Tehran having a nuclear deterrant against Israel a few days ago. It’s reported that AIPAC plans to spend $50 million to bribe the US Congress to reject the agreement. Contrary to that, the other face of AIPAC, the so-called J-Street is running a campaign to prove that the agreement is ‘kosher’ – because Obama administration wouldn’t had agreed to it unless it’s good for Israel. No matter which way the ‘Zionist pig’ sits – one thing is for sure, Israel will keep fabricating new lies about Iran’s cheating the agreement during the agreement’s next ten years to bring the Bomb, bomb, bomb Iran option back on US president’s table. And if you think I’m pessimistic, study US-Israel’s past record from some objective source. Professor Francis Boyle (University of Illinois) says: “This an attempt by the United states to reintegrate Iran into US imperial order for the Persian Gulf.” Boyle also fears that with the gradual improvement in Iran-US relations, Iran may cut back its support for Hamas and Hizbullah against the Zionist entity. Iran could also distance itself from Assad regime in Syria. Iranian, who don’t like Taliban, may decide to agree with a long-term US-NATO forces staying in neighboring Afghanistan. The China card will crank up the Iranian oil machine, this could make attacking Iran even less likely ~ certainly the 25,000 Jews who live in Iran/Tehran would not be a deterrent imo. Thanks Alan. The "GOP" POTUS-to-be fanatics indicate their extremism by their over the top words and actions. Hillary sounds bad enough, but now she and Dubya sound mild. The USA is on the verge of complete buffoonery, if not already there. "Sheldon Adelson, estimated by Forbes to be worth $29.4 billion." Well, not exactly "worth" anything at all, we can bet on it.